January general fund tax revenue turned out to be a bit “higher than estimated.” Good. That’s certainly a better situation than if monthly revenue were lower than estimated, as has been the case so many times over the last four years. 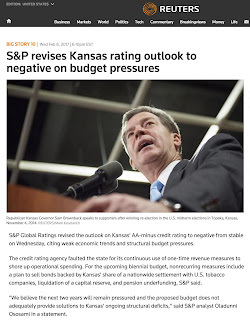 However, the January result does not alter the grim financial situation facing Kansas. Nor does it indicate that Kansas is now on some new financial trajectory. Remember, last November Kansas officials made revisions that dramatically lowered the estimate of FY 2017 revenue. The target was set so low that Kansas now expects to receive less tax revenue in FY 2017 than in FY 2016, and far, far less than in FY 2013, the year before income tax cuts fully kicked in. Beating the revenue estimate in January is not exactly a high bar. In FY 2014, general fund tax revenue fell $700 million when income tax rate reductions and the LLC loophole were implemented. Receipts never recovered, staying at that lowered level in succeeding years. Think about it this way: Even if revenue collections meet the “estimate,” Kansas has an almost $700 million structural budget gap in FY 2017. The official estimate forecasts recurring general fund revenue at $5.6 billion, against expenses of nearly $6.4 billion. A portion of that gap has already been closed by transferring hundreds of millions from the highway fund and other funds, but lawmakers still have around $350 million to go. The Legislative Research Dept. projects that the gap between revenue and expenses in FY 2018 will grow to around $900 million. Through the month of January, FY 2017 general fund tax revenue is $32 million higher than officially expected, but $11 million lower than the same period of the last fiscal year. The $32 million helps, but has essentially already been offset by a lower-than-expected amount from the sale of the Bioscience Authority and higher-than-planned-for Medicaid costs. If anything, the current gap between revenue and expense has grown, not diminished. Kansas’ financial troubles remain very, very serious. The financial wound inflicted by unaffordable income tax cuts will not heal on its own or through accounting tricks and one-time maneuvers. The amount of recurring revenue must be raised back up in order to reasonably meet expenses. Kansas lawmakers have to face the hard fact that they need a comprehensive revenue reform package to bring structural balance back to the Kansas budget. —This entry was originally published on the Kansas Center for Economic Growth website. Banner photograph by Edward C. Robinson III (Purchase). Simple theme. Powered by Blogger.